Caleb Wheaton Newell is shown with his second wife, Lucina Tolman Newell, and their daughter, Maria Lucina. Two children of Caleb Newell's and first wife, Mary Pease Newell are listed - son George Whitfield Newell and Mary Elizabeth Newell. 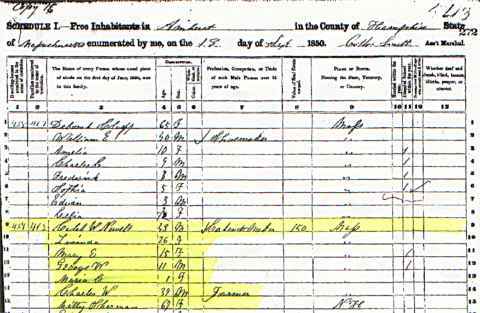 Caleb W. Newell's occupation is shown as Cabinet Maker. He owned a factory in East Amherst where he manufactured and sold various pieces of furniture. Caleb's brother, Charles William Newell, was a bachelor and lived with his brother for many years. Kitty Sherman is also on the census and is listed as being 67 years of age and born in New Hampshire.